116 fixing up my trunk and sent it down to the depot. I took supper and stayed all night at Mrs Gilletts. Charlie came up from the store early and we had a very pleasant evening. I was very tired tonight. 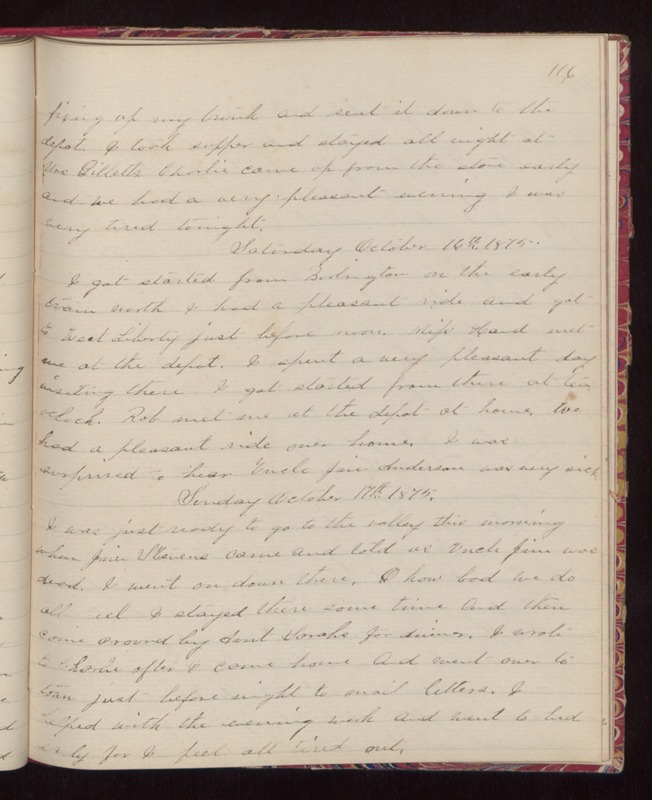 Saturday October 16th 1875. I got started from Burlington on the early train North I had a pleasant ride and got to West Liberty just before noon. Miss Hand met me at the depot. I spent a very pleasant day visting there I got started from there at ten oclock. Rob met me at the depot at home. We had a pleasant ride over home. I was surprised to hear Uncle Jim Anderson was very sick. Sunday October 17th 1875. I was just ready to go to the valley this morning when Jim Stevens came and told us Uncle Jim was dead. I went on down there. O how bad we do all feel I stayed there some time and then came around by Aunt Sarahs for dinner. I wrote to Charlie after I came home and went over to town just before night to mail letters. I helped with the evening work and went to bed early for I feel all tired out.